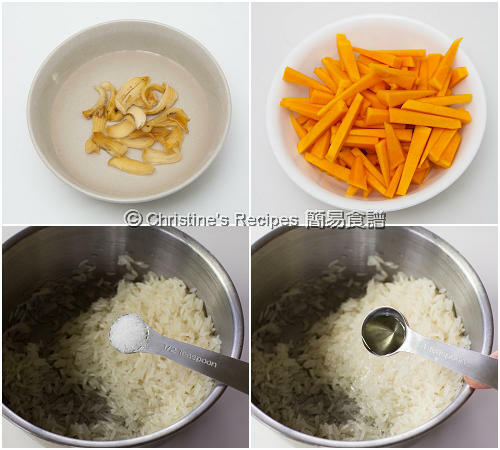 This pumpkin and lily root bulb congee is so good for cleansing our digestive system. I like the natural sweetness of pumpkin, that's going so well with the rice grains and lily root bulbs. I often like cooking pumpkin as it’s cheap, yet tasty and loaded with nutrients that will help our heart, bones, eyes and skin. I simply steam it, bake it or braise it with pork ribs. The cooking ideas of pumpkin are endless. 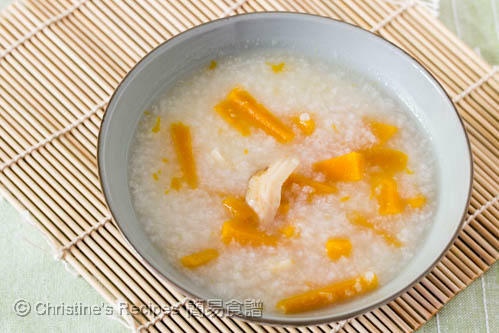 This time I experimented to make Chinese congee with pumpkin. Lily root bulb (百合), starchy and edible root vegetable of Lily, commonly used in making Chinese herbal medicine, soup or congee. You can easily found the dried ones packed in plastic bags in Asian grocers. That said, lily root bulbs are good for soothing the nerves and keeping lung health. After rehydrating the dried lily root bulbs, you can cook them with other ingredients. Top left: dried lily root bulb. Top right: peeled and julienned pumpkin. The mild natural sweetness of pumpkin goes really well with the taste of grains and lily root bulbs. 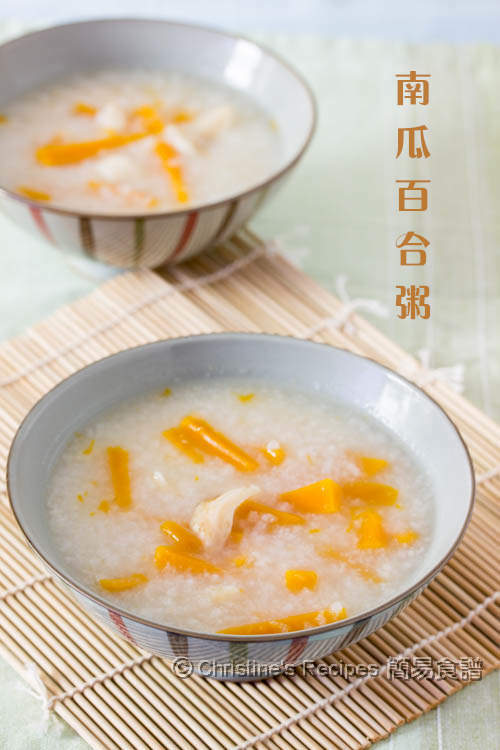 This congee can be served as breakfast or snack. Rinse rice and drain well. Mix with oil and salt. Set aside about 30 minutes. Soak the dried lily root bulbs until softened. Rinse and drain well. Set aside. Bring water to a boil over high heat. Put in the rice. Once it boils again, reduce heat to medium-low heat. Cook until the rice falls apart, about 1½ hours. Add pumpkin and lily bulbs. Continue to cook until the pumpkin becomes tender, about 20 to 25 minutes. Season with salt if necessary. Serve hot. If using fresh lily bulbs, no need to soak them in water. Blanch in boiling water instead. Drain out and cook them following step 3 in method section. Beware that the congee will spill out while cooking with lid on. You don’t want to lose the most delicious and nutritious part of the congee, or waste any time to clean up the stove. Be careful! So appetizing! A perfect Fall breakfast, Christine.